High-precision 4/8/12 MHz internal RC oscillator with 4 MHz default frequency for device startup. In-application trimming access for frequency adjustment. 8/12 MHz are factory-trimmed. Three USARTs. USART0/1/2 support LIN mode, ISO7816, IrDA®, RS-485, SPI, Manchester and Modem modes; USART1 supports LON mode. Two 4-channel 16-bit PWMs with complementary outputs, Dead Time Generator and eight fault inputs per PWM for motor control, two external triggers to manage power factor correction (PFC), DC-DC and lighting control. Two Analog Front-End Controllers (AFEC), each supporting up to 12 channels with differential input mode and programmable gain stage, allowing dual sample-and-hold at up to 2 Msps. Gain and offset error autotest feature. AES: 256-, 192-, 128-bit Key Algorithm, Compliant with FIPS PUB-197 Specifications ̶ Integrity Check Monitor (ICM). Supports Secure Hash Algorithm SHA1, SHA224 and SHA256. 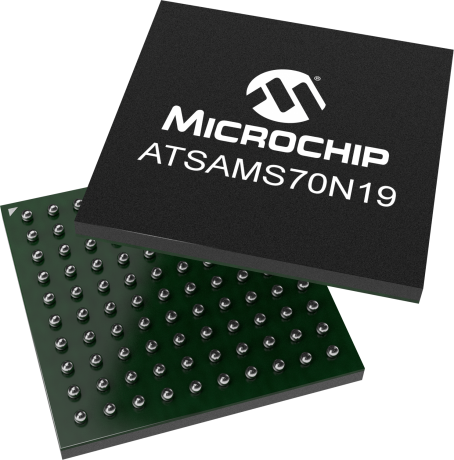 The Microchip SAMS70N19 devices are members of a flash microcontrollers family based on the high-performance 32-bit ARM Cortex-M7 processor with Floating Point Unit (FPU). These devices operate at up to 300MHz and feature up to 512 Kbytes of Flash, up to 256 Kbytes of multi-port SRAM and configurable Instruction and Data Tightly Couple Memories to leverage the advanced DSP capabilities of the core. SAMS70N19 features multiple communication interfaces including a HS USB Host and Device, a HS SDCard/SDIO/MMC interface, USARTs, SPIs and multiple TWIs. Analog features include dual 2Msps 12-bit ADCs with analog front end offering offset and gain error correction, and 2Msps 12-bit DAC. The SAMS70N19 is available in 100-pin QFP and BGA package options. The SMART SAM E70 Xplained evaluation kit is ideal for evaluating and prototyping with | SMART SAM S70 and SAM E70 ARM® Cortex®-M7 core- based microcontrollers. Extension boards for the SAM E70 Xplained can be purchased individually. The ATSAME70-XPLD evaluation kit does not include extension boards. The SAM V71 Xplained Ultra evaluation kit is ideal for evaluating and prototyping with the SAM V71, SAM V70, SAM S70 and SAM E70 ARM® Cortex®-M7 based microcontrollers. Xplained Pro Extension kits compatible with SAM V71 Xplained Ultra can be purchased individually. The ATSAMV71-XULT evaluation kit does not include extension boards. The SAM E70 Xplained Ultra Evaluation Kit is a hardware platform for evaluating the ATSAME70 and ATSAMS70 families of microcontrollers (MCU). Supported by both the Studio and MPLAB X integrated development platforms, the kit provide easy access to the features of the ATSAME70 and is a valuable assistant when integrating the device into a custom design.